Holidays, birthdays, anniversaries… there are plenty of occasions that call for that personal touch. But what can you do when you live in the US without unlimited¹ calling to Newcastle? You go to Vonage.com and sign up for the Vonage World® plan. Once you do, we’ll send you one of our famous VoIP devices, the Vonage Box™. For a low monthly fee, you’ll be able to make unlimited¹ calls to UK landlines. To reach a cell phone, you’ll only pay a small per-minute rate. It’s not just Newcastle, however. 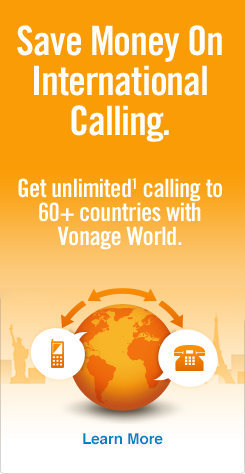 The Vonage Box will equip you with unlimited1 calling to landlines in over 60 countries and mobiles in more than 10 others. Cheap calls to Newcastle can be the norm from now on! Then, dial 191 — the Newcastle area code (landlines only*). Lastly, enter the local 7-digit Newcastle phone number. *When calling cell phones in Newcastle, enter the US exit code, the UK country code and then a “7” before dialing the rest of the 9-digit mobile number. If you’re unsure of how to dial the other major cities in the United Kingdom, we’ve put together a great how to call the UK guide for you to reference. Newcastle was once a major center for the wool trade as well as a hub for coal mining and shipbuilding. Today its economy is mostly business-centered. The past and the present are reflected in Newcastle’s streets. The roads still follow their original medieval layout, particularly the extremely narrow alleyways. Newcastle is also home to the famous Town Moor, that is larger than London’s two biggest parks combined. So if you haven’t visited yet, Newcastle could be the perfect location for your next trip! And if you need a hand, we can help you find the cheapest way to call Newcastle too.